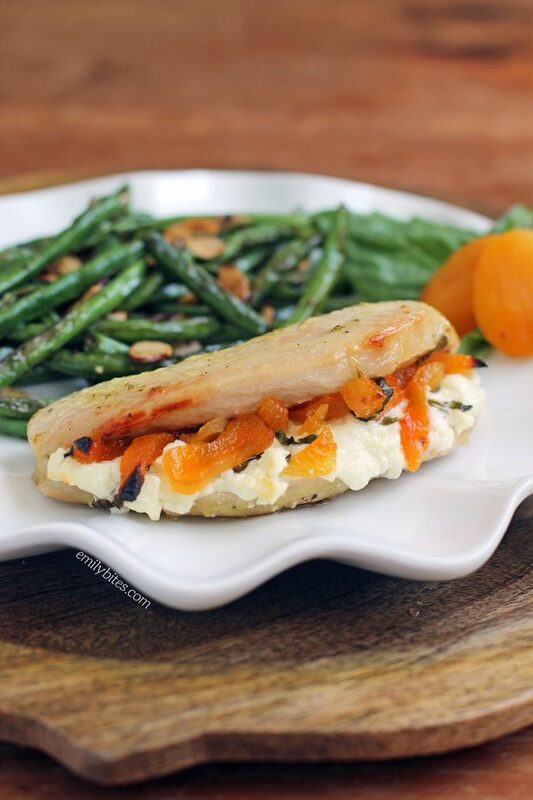 This Apricot Goat Cheese Stuffed Chicken was created in connection with my appointment as a contributor to the Nakano Natural and Seasoned Rice Vinegar. I have been compensated for my time commitment to work with their product, however my opinions are entirely my own and I have not been paid to publish positive comments. This Apricot Goat Cheese Stuffed Chicken is a little sweet, a little savory, and a whole lot of delicious. The basil citrus marinade is super bright and flavorful and the hearty serving of chicken is stuffed with creamy goat cheese, fresh basil and sweet, fruity dried apricots. This chicken comes together really easily for a quick weeknight meal but also looks and tastes impressive enough to serve to guests. You can put the marinade together in just minutes in the morning and when you get home from work all you’ll have to do is stuff the chicken and bake! This chicken pairs great with veggies or a side salad and each satisfying Apricot Goat Cheese Stuffed Chicken Breast is just 333 calories or 5 Weight Watchers SmartPoints! I’m really enjoying working with Nakano Rice Vinegar this summer (if you missed my previous posts, check out my Antipasto Salad and Mediterranean Topped Grilled Chicken)! Their seasoned rice vinegars are so easy to use in recipes and they’re also free of artificial ingredients, flavors and preservatives. I love all the different flavors, and the Citrus variety I used in this recipe is definitely one of my favorites. I adore anything and everything citrus, and this vinegar is lightly sweet with a mildly tangy vinegar flavor that would be perfect in a salad dressing, pasta or (of course) marinade! If you’d like to check out any of the fun flavors of Nakano Rice Vinegar for yourself, here’s a downloadable coupon you can use in stores. 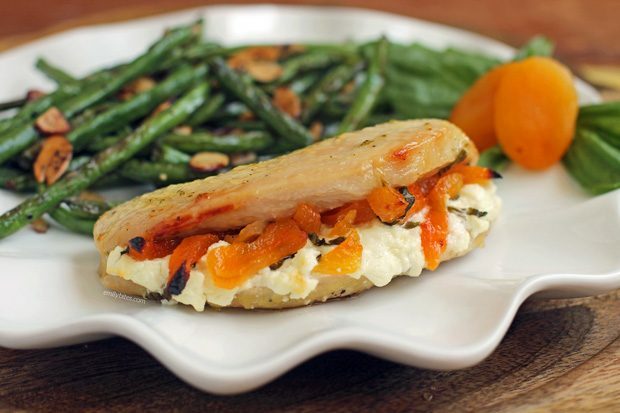 You can also sign up to receive more recipes using Nakano products like my Apricot Goat Cheese Stuffed Chicken, Antipasto Salad or Mediterranean Topped Grilled Chicken, along with cooking tips and coupons delivered to your inbox. Just subscribe to the Nakano e-newsletter by clicking here. For more tasty chicken dishes, check out the Chicken Category of my Recipe Index for recipes like Mediterranean Topped Grilled Chicken, Pimento Cheese Stuffed Chicken, Cheddar Ranch Chicken Tenders, Cream Cheese Stuffed Everything Chicken, Hummus Chicken Salad, Bubble Up Chicken Pot Pie Casserole, Cheesy Bacon BBQ Chicken and many more! Combine all of the marinade ingredients in a blender (I put mine in a cup and used my immersion blender) and blend until ingredients are well combined. Transfer the blended marinade to a gallon Ziploc bag and set aside. Place the chicken breasts on a cutting board. Using a sharp knife, slice the breasts from the side (creating a top and bottom) almost all the way through (we’re doing this before marinating so we don’t have to cut slippery marinated breasts). Add the chicken to the bag and seal. Use your hands to massage the chicken through the bag and make sure the breasts are evenly coated with marinade. Place the bag in your refrigerator and allow the chicken to marinate for 6-10 hours, turning the bag once or twice if possible to make sure the chicken is evenly coated by the marinade. When the chicken is done marinating, pre-heat your oven to 400 degrees and line a baking sheet with parchment paper. Remove the chicken breasts from the marinade and transfer to the baking sheet. Open each breast at the slit and spread one ounce of the goat cheese across the bottom inside surface of each breast. 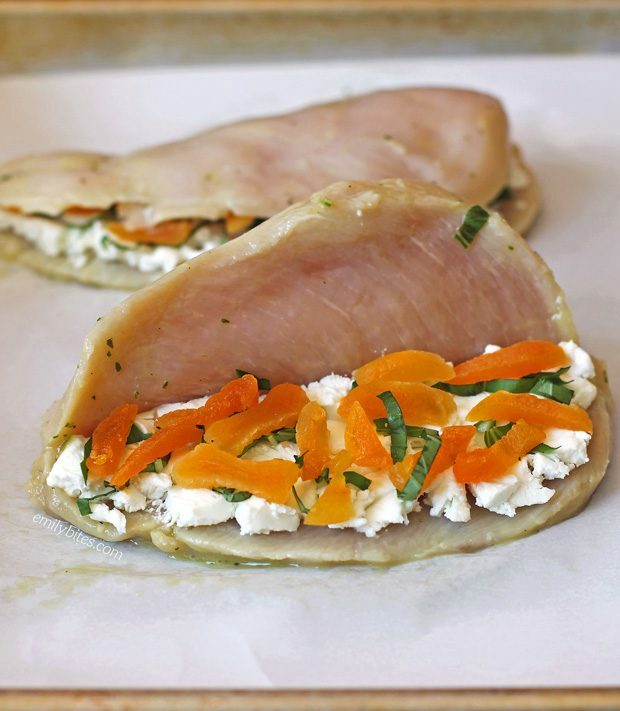 Sprinkle the sliced basil over top of the goat cheese in each breast and follow with the chopped apricots. Close the breast, folding the top half back over the apricots and cheese. Place the baking sheet of breasts into the pre-heated oven and bake for 30-35 minutes until chicken is cooked through. Serve warm. Emily–this looks delicious !! 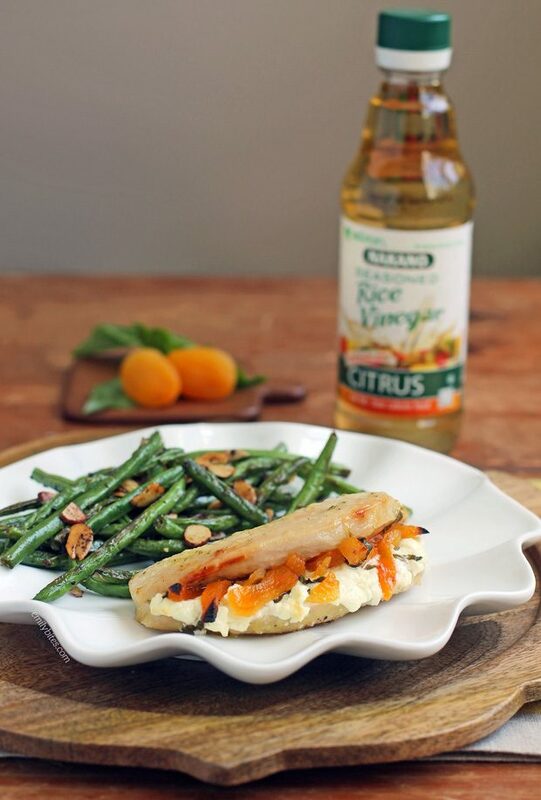 I doubt I can find the citrus flavored rice vinegar in my very small home town ..What can I use as a substitute ?? I can find plain rice vinegar I know ..thanks ! !